"Most of us, first time to have a toothbrush, first time to have a vaccination, first time to have a daily bath, all these firsts," said Harley Jolley, who joined the CCC in 1937. Another worker, Clifford Hammond, explained "I joined the CC’s in September of 1934. I was 18 when I went in. And they took them up to 25. I liked it mainly because that was the only time in my life I ever had two pair of shoes. You had your medical and three squares a day. And you only worked about six hours a day. I had been accustomed to working 12, 14 hours a day on the farm. I thought I really had it made." 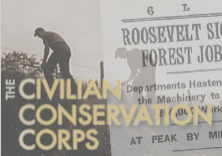 Source: PBS Civilian Conservation Corps Complete Program Transcript. If you've got ancestors who lived during the Great Depression, you'll want to catch the online version of this PBS television broadcast. This is great! Not only did I have relatives in the CCC, there are many CCC projects and camps all around me in New England. Their legacy still lives on in the White Mountain National Forest and other places nearby. My husband's grandfather worked for the CCC, in the Grand Canyon. I was thrilled to come across historical documents (and family photos) of his work there: http://www.cjroots.com/2012/04/our-family-history-tie-to-civilian.html. We're planning a trip to Grand Canyon within the next year to hike the CCC Trail that takes us to some of the very projects his grandfather helped build. When Mr. Myrt and I visited the Grand Canyon, we discovered many things the CCC created. Amazing work.